Automobile accidents and trucking accidents resulting in serious personal injury are often the result of negligence of third parties. Liability is determined by the law of negligence. South Carolina is a modified comparative negligence jurisdiction which apportions liability based on the percentage of fault of the parties involved. If plaintiff’s percentage of fault does not exceed 50%, the plaintiff is still allowed to recover from any defendant proven to be at fault. However, plaintiff’s damages are reduced by the percentage of plaintiff’s fault. A determination of negligence is based on the requirement that people must exercise a standard called “reasonable care under the circumstances” when operating a motor vehicle. Failure to do so is often the basis in determining damages caused by an accident. Many factors can contribute to the question of whether a driver was negligent, and courts look for these in determining fault. When you or a loved one is seriously injured in an automobile accident, it is important to secure the legal representation of experienced attorneys who know what steps to take, who know how to investigate and secure evidence and to locate all witnesses to properly prepare your case for trial. FIRM HISTORY: This firm was originally founded in 1926 by J. Davis Kerr (1903-1964) In 1960, Roy McBee Smith (1928-2006) joined the firm which became known as Kerr and Smith. Edwin C. Haskell joined the firm in 1983 and William McBee Smith joined the firm in 1988. 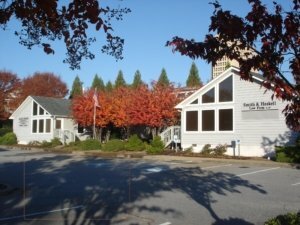 The firm’s name was changed to Smith & Haskell Law Firm with offices in Spartanburg SC. ATTORNEYS: The attorneys at Smith & Haskell are veteran civil trial attorneys with over 60 years of collective experience. Our attorneys handle litigation matters throughout South Carolina including serious personal injury, wrongful death, workers compensation, business litigation, elder law, probate and estate litigation. COURTS: The firm has a General Civil Practice representing plaintiffs as well as defendants in civil trials in state and federal courts including the South Carolina Court of Common Pleas, South Carolina Court of Appeals, the South Carolina Supreme Court, United States District Courts, the United States 4th Circuit Court of Appeals as well as litigation before administrative bodies. 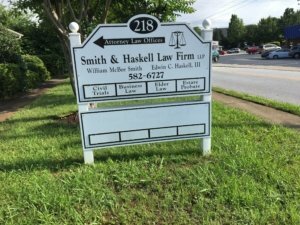 Smith & Haskell Law Firm, LLP handles legal matters not only in Spartanburg County but also in the surrounding counties of Greenville, Laurens, Pickens, Richland, York, Cherokee, Oconee, Union and Oconee, as well as throughout the State of South Carolina. The firm utilizes state-of-the-art computer systems and technology to meet the needs of its clients in an efficient, timely and cost-effective manner.